I read this article and found it very interesting, thought it might be something for you. 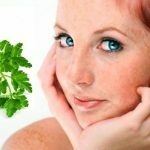 The article is called Face Mask For Freckles With Parsley and is located at https://homemademasks.net/homemade-face-mask/face-mask-freckles-parsley/. First of all I think there are definitely people out there that find freckles as being cute and maybe some of them might even think they give a certain charm to those who have them. At least that is what my mum used to say to me every time I complained about mine. I think I was around 13 or so, when I first started being aware and actually care about the freckles on my face. It was then when I developed a huge desire to find a solution that would get rid of them for good. I used to look through beauty magazines for herbal remedies that would make them fade away. And I did have one or two attempts in preparing some herbal potions which back then, proved to be unsuccessful. Although with time most of my freckles did vanished. But because I have quite a fair skin I still get some that reappear in the summertime. Freckles can be but also a sign of prolonged exposure to the sun, say the experts. The process is: pigments in the skin are affected by ultraviolet rays and some people are prone to develop those dark spots – freckles – which, with age, for some people can become larger. Sure you might be able to prevent the appearance of new freckles if no matter the season (summer or winter) you are using a moisturizer with SPF, like I do. Now I admit that my few freckles don’t bother me as much as they used to, but if you have not yet made peace with your freckles, I have a natural remedy that really works. The wonderful herb which will help you get rid off freckles is parsley. This plant is not only extremely beneficial for your health through its rich content of vitamins and proteins but it is also great if used properly for skin beauty. Parsley has in its composition vitamins, pro-vitamins, magnesium, calcium, phosphorus, potassium, sulfur, copper, amino, iodine, chlorophyll. The amount of Vitamin C existent in parsley is very high, about four times higher than that of oranges. Contains more iron than is found in spinach and twice the amount of protein found in an egg. Parsley juice can get rid of acne, clean your skin and gives glow and freshness while also removing freckles through its whitening effect. Finely cut the parsley and cover it with a glass of boiling water. Let it infused for 2 hours. Use this mixture daily by wiping the freckled areas until the stains are fading away.